Description 4 Rounds, Swiss System. Four Sections: OPEN (USCF-rated), UNDER 1600 (USCF-rated), U1200 & Unrated (CXR-rated), and U700 & Unrated (CXR-rated). Registration and Check-In 8:45-9:30 AM. First round 10 AM. 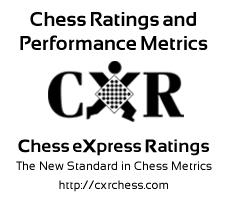 ENTRY FEE: $40 On-site for USCF-rated sections; $15 for CXR sections; DISCOUNTED Fee for Advanced Registration: $30 for USCF sections, $10 for CXR sections. Checks to: Westark Chess Club postmarked no later than May 2nd, to Karis Bellisario, 3409 Ramsgate Way, Fort Smith, AR 72908. Please include name, address, email, day and evening phone, USCF ID# and/or CXR#. Directions From Route 540, take Exit 2A onto Alma Highway (route 64). Make immediate left onto Alma Boulevard (just past Citizens Bank) and follow about 0.1 mile to Alma Circle. Ed Center is building with red roof.